What is the Power Program®? The POWER Program® is about you. It’s about bringing your skills and abilities to a level you never thought possible. Most successful business people have a coach, perhaps several, to help them achieve greatness. Albert Einstein said, “We cannot solve our problems with the same thinking we used when we created them.” That is the power of coaching … to help you learn new ways of thinking about your business, helping you break through the ceiling of production you may be hitting. The POWER Program® is about skill. Unlike other real estate coaching programs that focus mainly on accountability, or spending more money on self-promotional items, The POWER Agent Program® is about improving your interactions with buyers and sellers – and finding out what they’re really committed to, so you can help them achieve exactly that. Darryl’s philosophy has always been to “serve … not sell”. The POWER Program® is about results. For the last 25 years Darryl has been helping agents double their production over their previous year. The POWER Agent Program is based on Darryl’s bestselling book, How to Become a Power Agent in Real Estate. Each month, Darryl will be your personal coach to help you with whatever issue you may be having. Whether it’s how to manage your business, handle an objection, increase your sales effectiveness, or just to have balance in your life, Darryl will give you the information you need to have a breakthrough in that area. The real estate agent’s essential guide to harnessing true earning power How to Become a Power Agent in Real Estate® gives real estate agents both the powerful sales techniques and the practical management tips they need to double their income by closing more transactions. 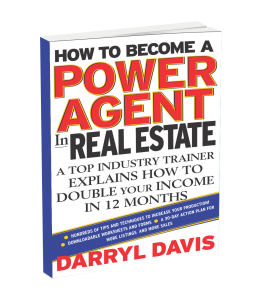 Based on the outstanding success of Darryl Davis’s seminar “The POWER Program®,” this motivational guide utilizes POWER Principles to help the new agent as well as the experienced top producer dramatically increase listings and sales. The book is full of Davis’s surefire methods for managing the sales process, including time management for agents, prospecting for listings, handling the seller’s and buyer’s concerns, maintaining a winning attitude, and generating more sales in less time and how the top producers work smarter­­, not harder. Offering field-proven tools and techniques, Davis shows agents how to progress at their own pace to their own personal Next Level® and accelerate their entry into Top Agent status.